Mossy Basket Nest filled with iris,daffodils,tulips, wax flower and greens. 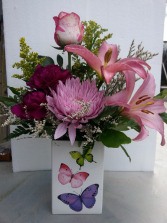 A a bird is added to make it all come alive for the perfect gift for any occasion. 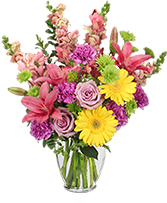 Peach Roses, Babys Breath, And Greens Designed In A Purple Vase. 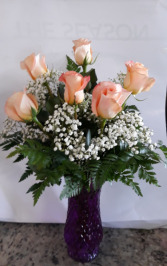 Roses for any day to make her feel special.This is a beautiful peach rose that shows off the skill of the designer.It can come in any color you choose.